KOBANE – The bodies of drowned Syrian boy Aylan Kurdi, his brother and mother have been buried in Syria’s Kobane after being transported from Turkey. 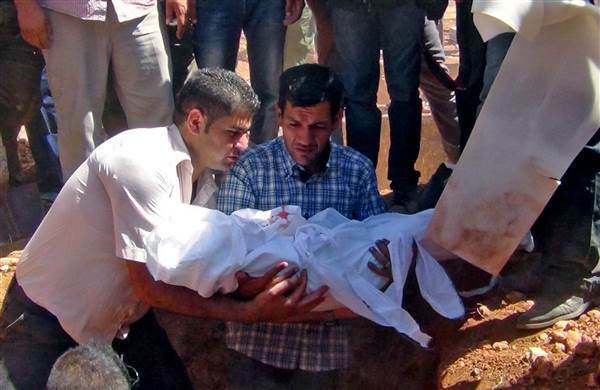 Three-year-old Aylan, five-year-old Galip and their mother, Rehan, were buried in the Kurdish city of Kobane on Friday. They were among at least 12 people who died on the boat headed for Greece. The boat was part of a flotilla of small dinghies boarded by passengers at Akyarlar, the closest point to the Greek Aegean island of Kos. Alan’s father Abdullah Kurdi, who survived the incident, returned to Syria with the coffins of his family members on Thursday. A convoy of vehicles with the bodies crossed into Kobane from the Turkish border town of Suruc, officials said.